The Study Department is on the ground floor in Dejvice, Technická 4, Praha 6. 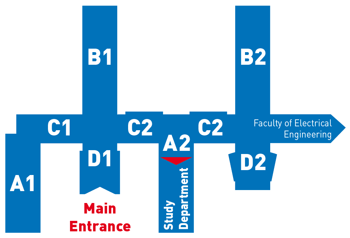 Enter by the main entrance, go through the hall, turn right and after a few metres turn right again into a corridor A2 where you find the entrance to the Study Department. VALID FROM 1. 10. 2018!